HomeCompetitionGadgetsHealthMedicalSmartphonesWater11-Year-Old Student Gitanjali Rao from U.S. Invented an Affordable ‘Tethys’ Water Testing Device! 11-Year-Old Student Gitanjali Rao from U.S. Invented an Affordable ‘Tethys’ Water Testing Device! An Invention is like a food for the development of new technology and from the beginning of time, humans everywhere have been inventing. In fact, most of the inventions what are around you now were invented by someone in the past! For example, Benjamin Franklin’s discovery of the electrical effects of lighting led him to invent the lightning rod around 1752, has made buildings much safer places during thunderstorms and still in use today. Young students are particularly well suited to be inventors, as talented and creative as adults. They often have more open minds and enthusiasm than older people. An important lesson for any student, who wants to invent some unique product, is to accept the failure. It may happen you won’t get a perfect result at the first attempt. 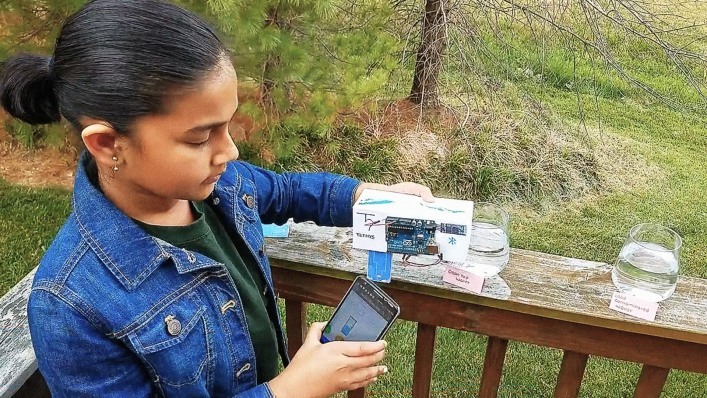 One should get an inspiration from this student inventor Gitanjali Rao, an 11-year-old girl from U.S. who has invented a device called “Tethys” which tests for lead contamination in water and it could significantly improve the response to chemical disasters. Rao, a student at Brentwood Middle School in Brentwood, Tennessee, is one of the finalists in one of the most distinguished science competitions, the 2017 Discovery Education 3M Young Scientist Challenge in the U.S.
How does her invention Tethys work? The device uses a disposable cartridge containing chemically treated carbon nanotube arrays and connected with an Arduino technology-based signal processor with a Bluetooth attachment. By treating the tube with atoms that are sensitive to lead, she is able to measure whether potable water is contaminated with lead, and beaming the results directly to a Bluetooth-enabled Smartphone. The device, which is reusable, warns that the water is unsafe when it detects levels higher than 15 parts per million. It is a really creative invention that could help millions across the world! “There are over 5,000 water systems in the U.S. alone with lead contamination issues. Timely detection and preventative action can help mitigate the problem, but today it takes a long time because of chemical labs and expensive equipment. My solution addresses a core issue of speedy detection of lead contamination, allowing preventative action and even saving lives!” further added. According to Rao, this device is affordable and efficient, it could cost as little as $20 or less and will make it more accessible to people. She now works with a mentor at 3M to further developing this product so that people can buy easily.